There has been so much to be upset about with all the proposed regulations. I thought I’d share a bit of what I love about the Bahamas and the guides who work those waters. 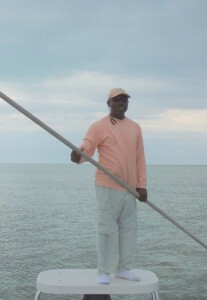 Some of my best bonefishing memories have been with Bahamian guides. 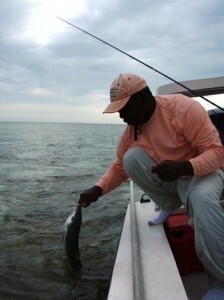 A good Bahamian guide, guiding in a place they know and love is a special experience. 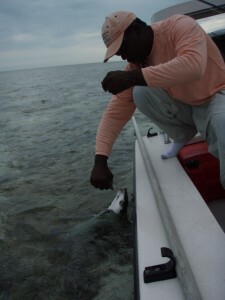 There are several days that really stand out for me and one of those days was with Captain Perry on Grand Bahama. 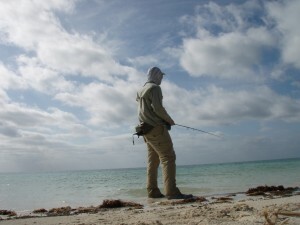 I fished with him on my second trip to Grand Bahama and I had something like three days (maybe four?) on my own and then one day with Captain Perry toward the end of the week. I’m not sure where he’s guiding now… heard he is at East End Lodge, although when I went with him he was independent. We met in McClean’s Town and fished the waters off the East End. Going out with Captain Perry was an education. I didn’t know much about bonefish at the time, although I was a bit fixated. My interest did not match my experience level (maybe it never will). I didn’t KNOW much. Knowing comes in part from bits of knowledge, but equally from experience, from doing the thing. Captain Perry worked with me on my casting (which was kind of bad at that point) and helped me understand how to present the fly, how to move it, how to see the fish better. 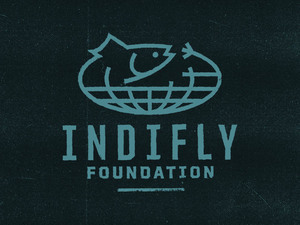 He helped me in so many ways… it was a critical day on the water for me, for my development as an angler. It was exactly what I needed. He knew his waters so well. We could hear other boats running, trying to find the sun on a mostly grey day, but Captain Perry knew where the fish were going to be. He trusted to his experience and his deep knowledge of place and he put me on fish after fish. Some of these fish I even managed to catch. 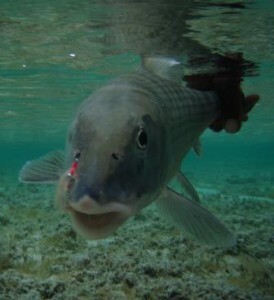 We talked about conservation and about preservation of bonefish and we talked about the Bahamas. His sense of place, his love of his home shone through so clearly to me. He was a man doing what he was meant to do in the place he was meant to be. He was a steward of the fishery, a protector and a proponent. That’s how it is when you go with a really good guide. 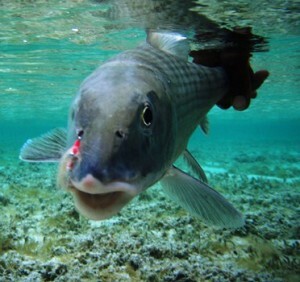 You feel like they are almost part of the environment themselves, like they are a vital piece of it, like the mangroves or the bonefish themselves. 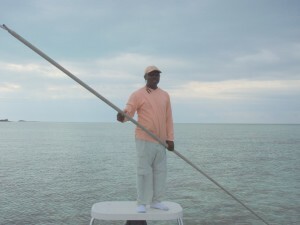 When I think of the Bahamas I will forever think of that day with Captain Perry… for the fish we caught and the knowledge I gained and for my appreciation of just how deeply Captain Perry knew and loved his home waters. I couldn’t have done 4 days of guiding. I didn’t have the money for that. My DIY days were mostly fruitless (I think I caught 2 fish on my own). I saw plenty, but they were in really well know spots with a lot of traffic and the fish were smarter than my skills would allow for. That’s how I did trips then, a few days of DIY and one guided day. The guided day was always, and probably will always be the highlight. I was there because I could fish by myself some too. Those fishless days were good days. I valued the time on the water, learning more and more about the place and the fish and the tides and more. I bought a shell from an old lady who has a stand on the road to the East Side and I stayed in a motel in Freeport, ate at restaurants there and rented a car. I probably spent $1,500, not including air fare. It wasn’t a lot of money, but it was more than I would spend on anything else. I’m hoping the Bahamas remains a place where I am welcome, a place where I can poke around on my own and get a guide when I want/need/can afford to. I’m sure the Keys need you too… and Hawaii… and just about everywhere… so, take that tax refund and book a trip somewhere, anywhere. When I was in Grand Bahama in January it was clear business was way, way off. Folks looked surprised to have a yank walk in mid-week. The guide I booked for one day didn’t have another booking for a month. 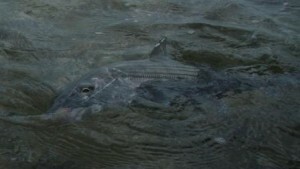 I saw Moldy Chum call out the numbers… the business of bonefish has been hit 30%-50% over the past two years. That guide that’s been hard to book might be a little easier to book. Give Captain Perry a call. He’s fantastic.